Elle Macy. Photo by Lindsay Thomas. Elle Macy is from Huntington Beach, California. She studied at Orange County Dance Center and on scholarship at Pacific Northwest Ballet School. She attended summer courses at the School of American Ballet, American Ballet Theatre, and Pacific Northwest Ballet School. Ms. Macy joined Pacific Northwest Ballet as an apprentice in 2012 and was promoted to corps de ballet in 2013. Ms. Macy has won awards from several competitions, including the Youth American Grand Prix, Spotlight Scholarship Competition, and Dance Masters of America. My mom. She was my first dance teacher. She lived and breathed dance… And for the longest time I thought I loved to dance because she did. I’ve since realized that if my days were not consumed by this art form, I would be a very different person. Dance keeps her close to my heart. I’ve been very into brunch lately. Every Sunday (or Monday off), Dylan and I try to find a new spot. Usually on the hunt for chicken and waffles… Often running into Leta Biasucci! Local 360 – amazing chicken and waffles!! Mondays only. Who has been your most favorite stager/choreographer to come to PNB? I started writing this answer and was overwhelmed by the number of amazing choreographers/stagers we have the privilege of working with here at PNB. William Forsythe, Crystal Pite, Alejandro Cerrudo, Pablo Piantino, Judy Fugate, Bernice Coppetiers, Twyla Tharp… I could go on and on. Each choreographer/stager has their own philosophy and wisdom that they share with you. This stuff is gold. Each experience continues to shape me into the artist I aspire to become. Wayne McGregor, David Dawson, Alexander Eckman, Alexei Ratmansky… I could go on and on. The biggest part of my performance ritual is the art of doing my makeup. I am not particularly great at it, but I love the act of putting it on. I try to completely zone out my surrounding. It helps me feel centered and calm. Side note: I’ll probably will be listening to something ridiculous (i.e. Broadway show tunes), which probably counteracts any zen I’m trying to find. Favorite snack to get you through a long rehearsal day? Everyone in the company may say Flaming Hot Cheetos… And they are probably right. Elle Macy and Steven Loch rehearsing In the Middle, Somewhat Elevated. Photo by Angela Sterling; choreography by William Forsythe. 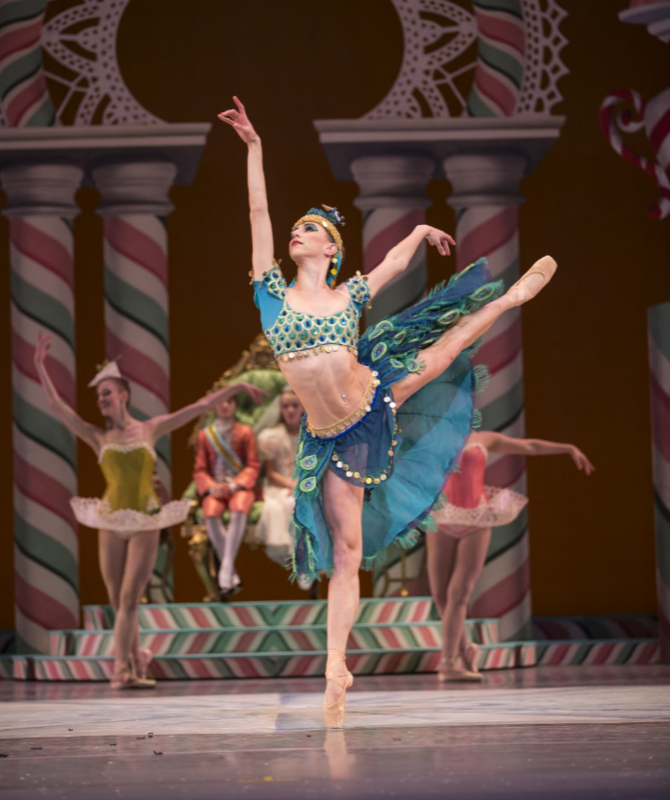 Elle Macy as Arabian Coffee in George Balanchine’s The Nutcracker. Photo by Angela Sterling. Elle Macy and Jerome Tisserand in Little mortal jump. Photo by Angela Sterling; choreography by Alejandro Cerrudo.